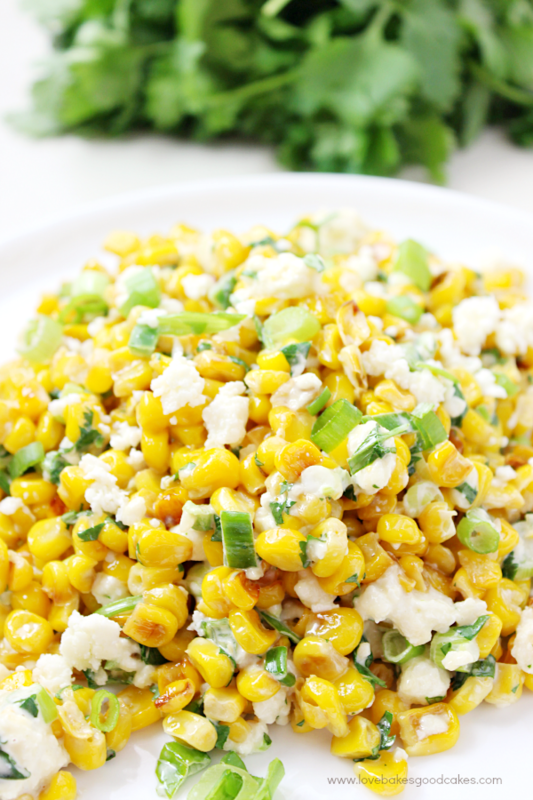 All of the flavor of Elote in a delicious and easy Mexican Street Corn Salad! 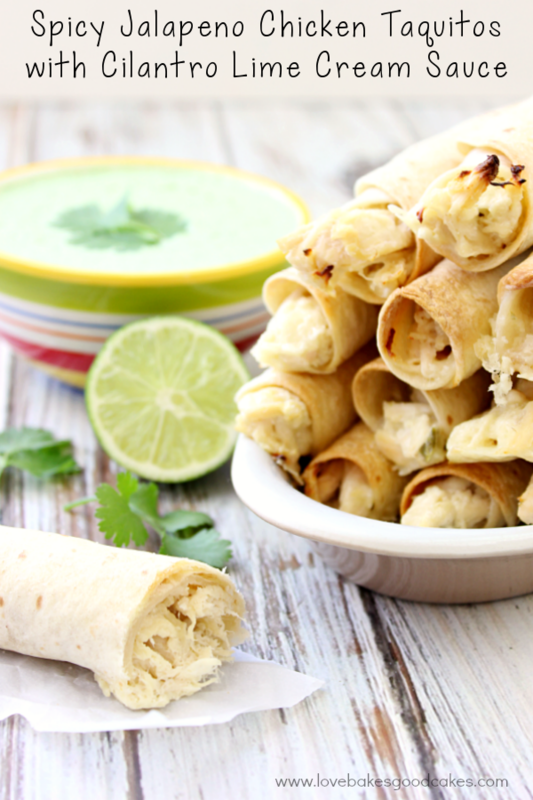 This is sure to become a favorite side dish with any Mexican meal! 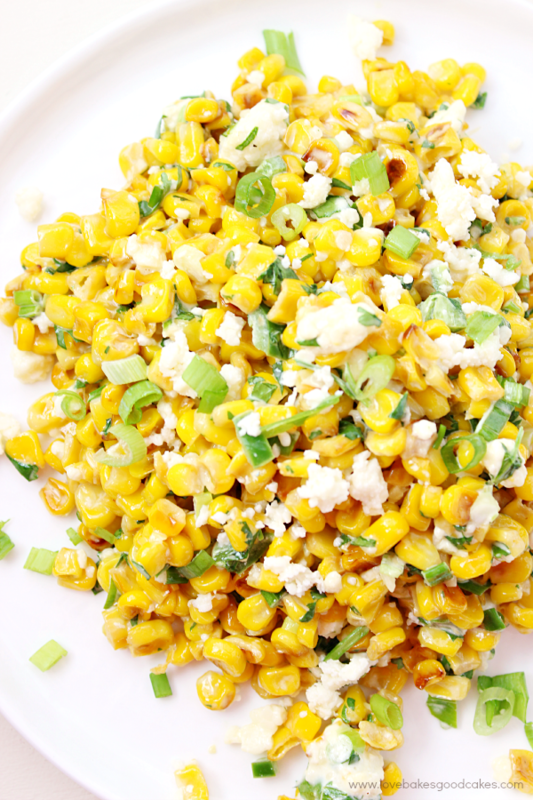 Great for summer fresh corn! I hope everyone had a safe and happy 4th of July weekend! We took it easy this year. Since I turned another year older Saturday (ugh! ), I needed to take it easy this year. I just wasn’t up to a big celebration. Do you ever have years like that? Of course, we did grill burgers and had all the fixings … and I even got Isaac to make my cake for me this year! The neighbors down the street put on an awesome fireworks show, so we just took the lawn chairs out in front of the house to watch! No crowds = the best way to celebrate any holiday or birthday! Having a 4th of July birthday, I grew up thinking that the parades and fireworks were just for me …. as in, for my birthday. Yes, I really thought I was that special! Haha! Normally, I would be the first person to want to do the parades and fireworks. I have always had to deal with tons of other people out celebrating and really, I am okay with that, just not this year. 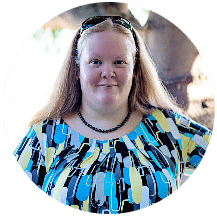 I was not feeling the “all of the other people thing” …. and I’m not even sure why other than I just did not feel like dealing with crowds. I dunno ….. maybe I’m becoming that grumpy old person that yells at the kids to get off of their lawn?! Maybe it’s just a funk?! Let’s hope it’s just a funk! Since Isaac is 14 and he volunteered to bake my birthday cake, and it being his first cake to bake by himself (I was taking it easy, remember?! ), I got him a boxed cake mix and canned frosting to make. I realized how sheltered my kids are when Gabriel (who is 6 yr old) asked Isaac what was in the can – referring to the frosting! In his 6 years, Gabriel has never seen canned frosting!! Oh boy!! Although it was a boxed cake mix and canned frosting, Isaac did a great job – and it was even better since I didn’t have to make it myself! Along with our cake and burgers, we had some of the typical cookout sides – baked beans, potato salad, and a fruit salad. Nothing super fancy. 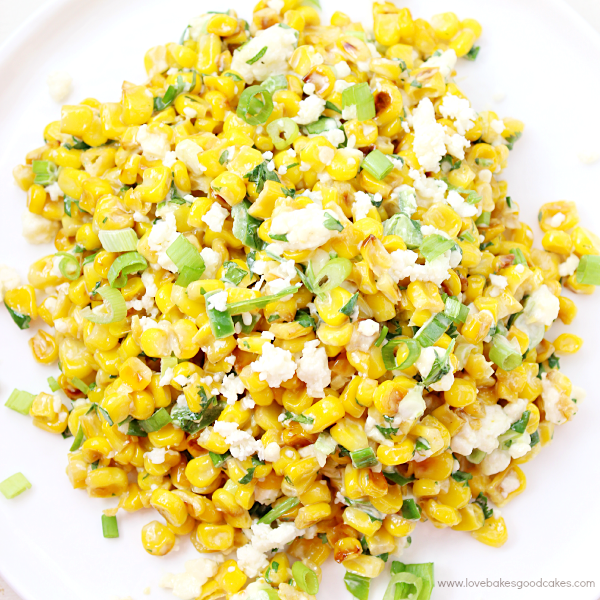 But I figured since it was my birthday, I was going to make this awesome Mexican Street Corn Salad too. Our family loves it and although we usually have it with tacos, I thought it would be great for our 4th of July cookout! My kids actually fight over who gets any leftovers or seconds of this salad! Yep, it’s that good! In a large non-stick skillet, heat oil over high heat until shimmering. 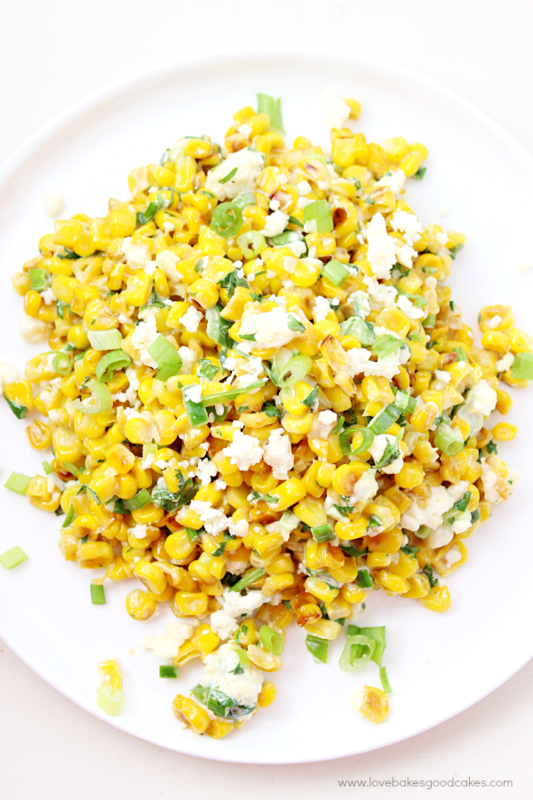 Add corn kernels, season to taste with salt. Stir once and let cook without moving the corn until charred on one side, about 2-3 minutes. Stir corn and repeat until charred on second side, about 2 minutes longer. Continue stirring and charring until well charred all over, about 10-12 minutes total. Transfer corn to a large bowl. Add mayonnaise, cotija cheese, green onions, cilantro, jalapeño, garlic, lime juice, and chili powder and stir to combine. Taste and adjust seasoning with salt and more chili powder to taste. 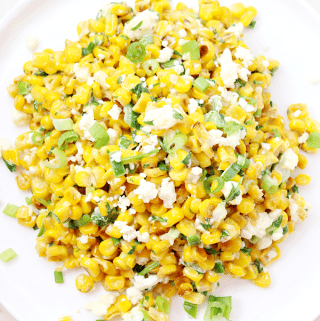 I’ve shared one of my family’s favorite summer recipes using corn – what is one of your favorite ways to enjoy fresh summer sweet corn? Yum! That looks excellent and a lot less messy that the on the cob version! Happy belated birthday! It really is that good! Thanks for stopping by, MamaMummyMum! I totally feel you on the funk. I get like that too. I love that you turned the reins over to the kiddos for desert. That's gotta feel good. This recipe sounds delightful. We always just eat corn on the cob but I'm always looking for something new. Definitley trying soon! It was so nice to just relax! I'm just glad my kiddos are getting old enough to give me a break now and then! I hope you enjoy the recipe, Malia! This looks delish, may I ask, what is cojita cheese? I've never heard of it! We stayed home on the 4th too, not up to crowds this year either. We grilled out and had a great dinner, the neighbors shot off a gazillion dollars worth of fireworks so I saw them too, perhaps next year. Happy Birthday and thanks for the recipe. Thanks, Nikki! Cotija cheese is a hard, crumbly cheese from Mexico. In my local store, it is sold in a small round package near the chorizo and cream cheese – I'm in the Phoenix area, so we have a large Mexican population! If you can't find cotija, Feta might be a good substitute! I can eat corn everyday ! Looks great and love the ingredients, Jamie ! 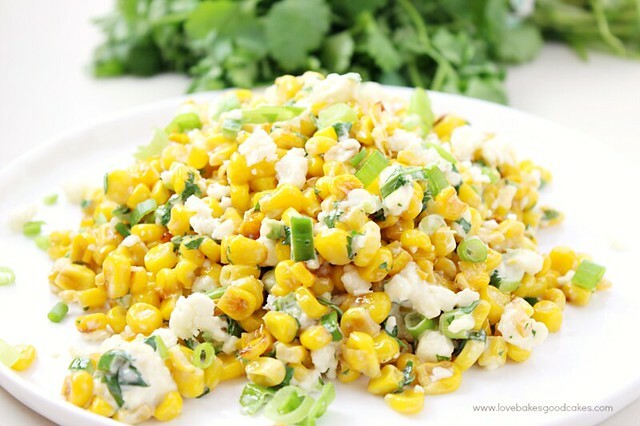 This corn looks amazing and fresh corn is in abundance right now, perfect timing!! YUM!! This sounds like an awesome side dish for the nachos I have planned for later this week! Visiting from Wonderful Wednesday. Oh my gosh, this sounds like the perfect corn dish to me. 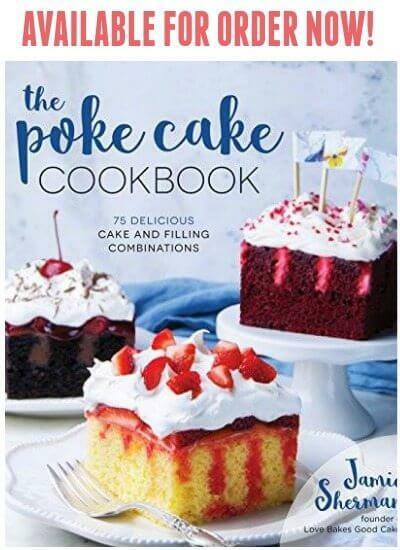 I am totally going to make this, and not share! Thanks! Sounds like you had a happy birthday, Jamie! My great-grandmother's birthday was the 4th of July, and we always had such wonderful celebrations every year for her. 🙂 There's no better way to celebrate than with a big ole side of street corn! This looks amazing! This is so good! A friend made it and I just had to have the recipe. My work peeps loved it too! So glad to have found this recipe. 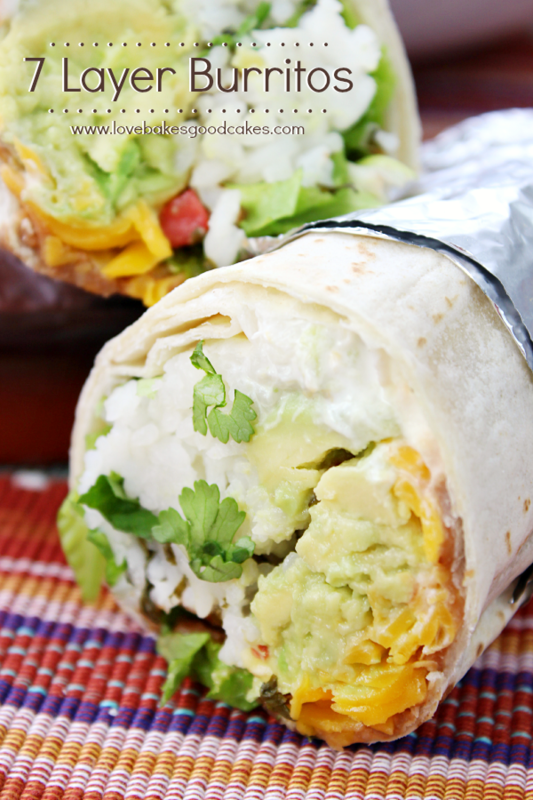 Need a dish to take to a cinco de Mayo luncheon this Saturday, and this sounds perfect. The ingredients look delicious, and seeing Cotijo, my favorite Mexican cheese, made it a no-brainer. Can’t wait to try your recipe!